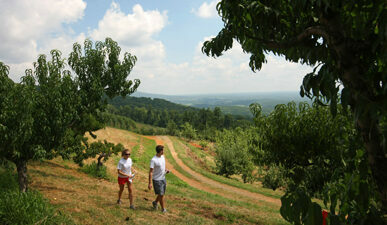 Carter Mountain Orchard overlooks dramatic vistas and acres and acres of fruit trees and grapevines. Mere minutes from Monticello, Thomas Jefferson’s home, and just down the road from historic Michie Tavern, the Orchard welcomes visitors from mid-April through November (and weekends in December). In spring, apple blossoms cover the orchard. In early summer, our country store features tree-ripened ready-picked peaches, nectarines, and local veggies, as well as hot, fresh peach cider donuts, and plenty of ice cream and cider slushies! 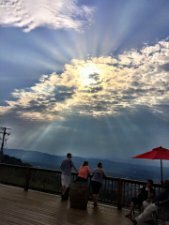 Thursday evenings, the Mountain is hopping with live music, food, wine, hard cider, and good times. From mid-August until mid-December, you can pick-your-own or buy fresh-picked apples, fresh-pressed apple cider, homemade apple cider donuts (a runaway hit year after year), and our tasty apple pies and apple caramel cookies. In the fall, the Orchard brims with pumpkins, gourds, and Indian corn. Topping off the day are hayrides around the Orchard—all in all, a perfect way to enjoy the beautiful Virginia countryside. Planning a visit to Virginia? The Artisan Trail Network is a great resource for discovering unique excursions and activities in our area. Visit the Monticello Artisan Trail page to view artisan studios, craft-related venues, agri-artisans/farms, area restaurants, lodging options, and other points of Interest in Albemarle and Nelson County. We’re glad you are visiting us! 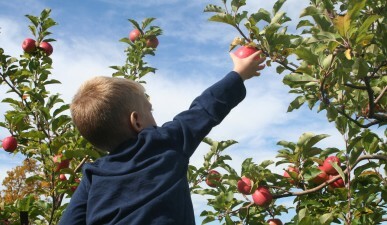 Here are some guidelines to help you make the most of your visit to Carter Mountain Orchard. There’s usually something fresh and ready at Carter Mountain! Whether you pick your own fruit or buy it fresh-from-the-tree in our Country Store, you can be assured you are getting the highest quality around.